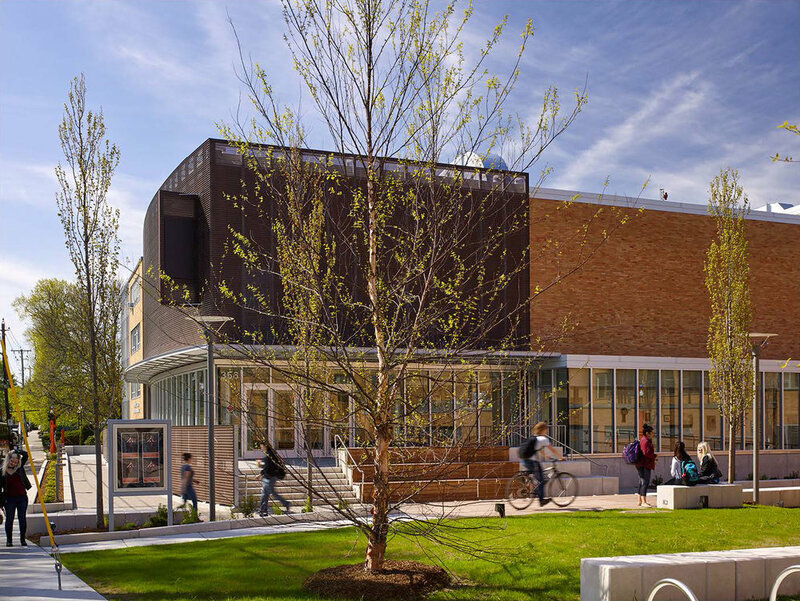 This project is the landscape associated with a renovation of Salem State’s Mainstage Theatre hall, located at the edge of Salem State’s campus along Lafeyette Street. The selected design responds to the use of the theatre for large scale performance events as well as the theatre’s use as a teaching studio and the associated more casual daily experiences of the students. Design improvements include an upper terrace adjacent to the theatre lobby, a lower green courtyard at the street level connecting to other buildings, a wide sloping walkway up to the terrace, and a set of stairs that expand into stepped seating areas. A cohesive identity that flows seamlessly from inside to outside is the aim of this project, with a potential outdoor theatre space creating a dialogue between building and landscape. Seating elements integrated into steps along the building create small gathering spaces, while a green area provides lounging and open space. Through shifting the access to the theatre from a frontal position on Lafayette street to the side to face the courtyard, the proposed design provides a more sensitive interface to the residential neighbours across the street. Both universal design and sustainability were major drivers of the landscape - the sloping walkway is given prominence in the design and made wide enough to invite all users as a primary access route. Permeable pavers, drought tolerant plants and black locust wood decking are only some of the sustainable features being pursued in the project.